With the end of the Cold War came not the end of history, but the end of America’s sense of its strategic purpose in the world. Then, after a decade of drift, the United States was violently dragged back into international conflict. Its armed forces responded magnificently, but its leaders’ objectives were substantially flawed. We fought the wrong war—twice—for reasons that were opaque, and few American citizens understood the cause for which their sons and daughters were fighting and dying. War is a poor substitute for strategic vision, and decisions made in the heat of imminent conflict are often limited by the emotions of the moment. 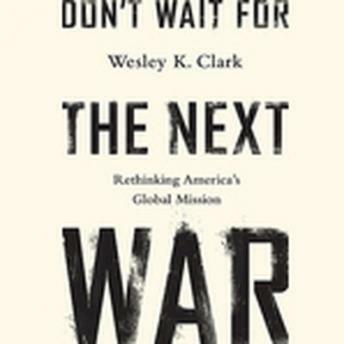 In Don’t Wait for the Next War, Wesley K. Clark, a retired four-star general of the US Army and former Democratic candidate for president, presents a compelling argument for continued American global leadership and the basis on which it can succeed: a new American strategy. America needs both new power and deeper perspective. The platform for American leadership is to use America’s energy resources to spark sustainable economic growth, building new strength to deal with pressing domestic issues like the deficit as well as the longer term challenges to US security—terrorism, cyber threats, the next financial crisis, China’s rising power, and climate change. Such a strategy is not only achievable but essential, and it is urgently needed. This is the true test of American leadership for the next two decades, but it must start now so America has the power and vision to deal with the acute crises that will inevitably come—in the Middle East, Europe, or Asia.